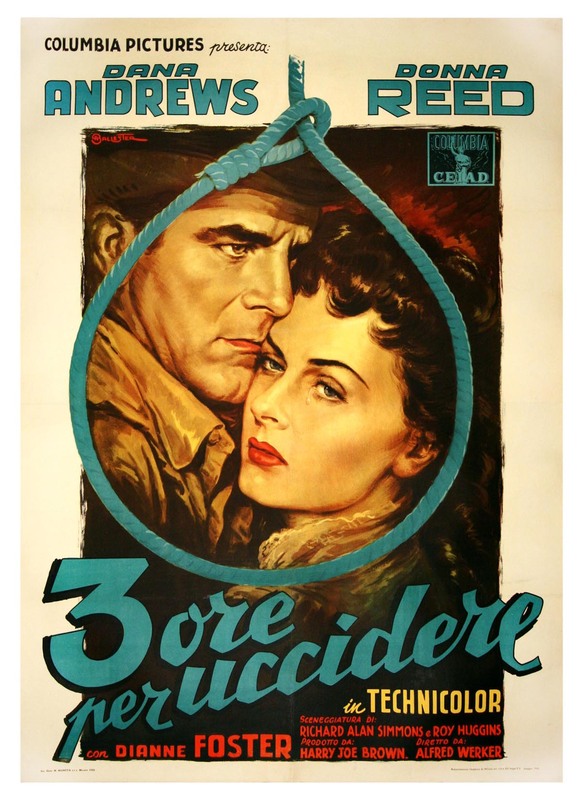 In the classic western The Ox-Bow Incident (1943), Dana Andrews was one of three innocent victims of a lynching, along with Anthony Quinn and Francis Ford. In this, Andrews returns three years after he was the victim of an unsuccessful lynching attempt to find out who was responsible for the murder for which he was almost killed. There are mixed, but mostly negative, reactions as Jim Guthrie (Dana Andrews) confronts one by one the leaders of the lynch mob. In flashback we see the story of how banker Carter Mastin (Richard Webb) was killed at a dance, with certain strategic gaps so we don’t know who actually did it. Guthrie’s main suspects are saloon owner Sam Minor (the unctuous James Westerfield), barber Deke (a frazzled Whit Bissell), hostile rancher Niles Hendricks (Richard Coogan) and smooth gambler Marty Lasswell (Laurence Hugo). Guthrie’s long-time friend Ben East (Stephen Elliott) is now the sheriff, and he doesn’t immediately lock Guthrie up, although Guthrie is still officially accused of the murder. 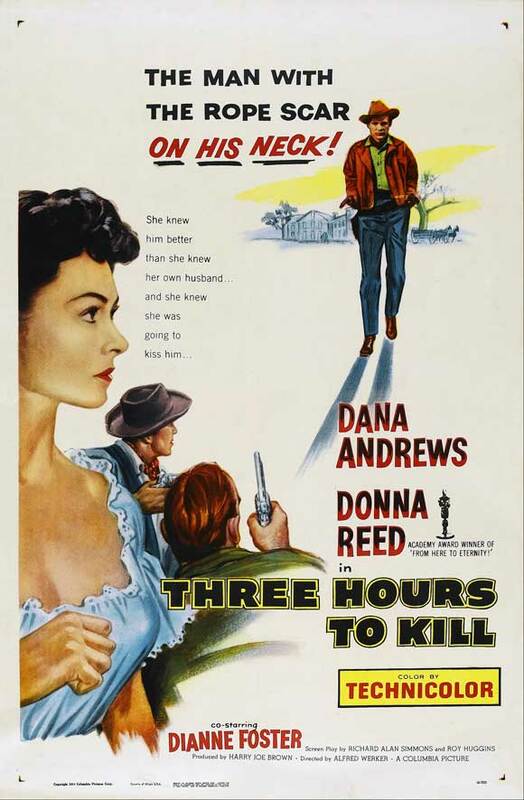 Instead, Ben gives Guthrie three hours until he has to leave town—hence the title with the double meaning. 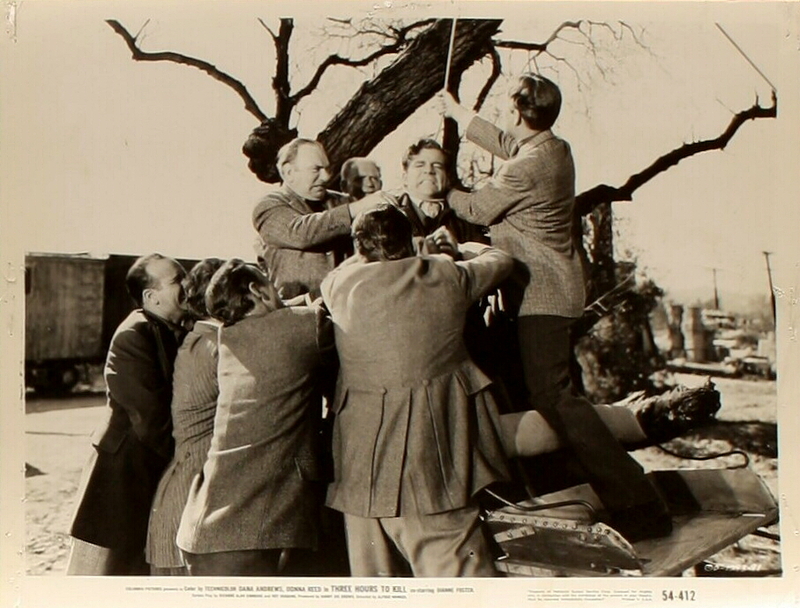 Flashback: Irate citizens attempt to hang Jim Guthrie (Dana Andrews) immediately after the banker’s murder. None of the four candidates seems entirely satisfactory as the real killer, and a lot of people disliked Carter Mastin, but other matters develop as well. When Guthrie barely escaped with his life, his fiancée Laurie Mastin (Donna Reed), sister of the murdered man, was pregnant and married Niles Hendrick to give her son a father. Saloon girl Chris Palmer (Dianne Foster) still has a thing for Guthrie, although he doesn’t appear interested. Gambler Lasswell has two women (unusual in a 1950s western) and attempts to leave town with them but is apprehended by Guthrie. 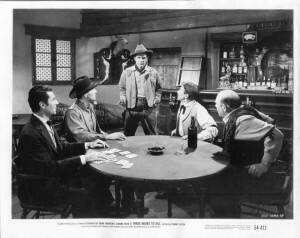 Jim Guthrie (Dana Andrews) holds his four murder candidates at Sam Minor’s saloon. [Spoilers follow.] As the four principal suspects sit out the three hours in Minor’s saloon, they review the events of the night of the murder. Laurie still seems to have feelings for Guthrie, but will he break up her family? As the accounts of the murder are examined, a new candidate starts to emerge, although we know him and see it coming. In the end, Guthrie and the real killer shoot it out, Laurie stays with her family, and Guthrie and Chris ride out of town together. This is a modest, effective and underrated western whodunit, and it is not really well known today. Dana Andrews is remembered more for modern roles (Ball of Fire, Laura, The Best Years of Our Lives, etc. ), although he made a number of westerns, even some good ones (The Ox-Bow Incident, Canyon Passage, Strange Lady in Town). In the early 1950s Donna Reed made several westerns (The Far Horizons, Gun Fury, Hangman’s Knot, They Rode West, Backlash, etc. ), and she is good here as the conflicted Laurie in a difficult situation. This was produced by Harry Joe Brown, who did a number of Randolph Scott movies, including those with director Budd Boetticher. 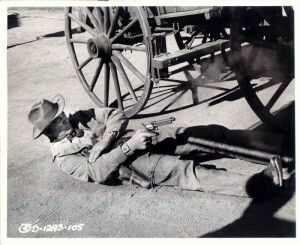 Eventually, of course, Guthrie (Dana Andrews) is forced to resolve matters in a final shootout. On the whole, it’s worth watching and should be more widely remembered. In color, at 77 minutes. For another western featuring vengeance from an innocent man almost lynched, see Clint Eastwood in Hang ‘Em High. This entry was posted in Westerns Worth Watching and tagged Dana Andrews, Manhunts on May 7, 2015 by Nicholas Chennault.